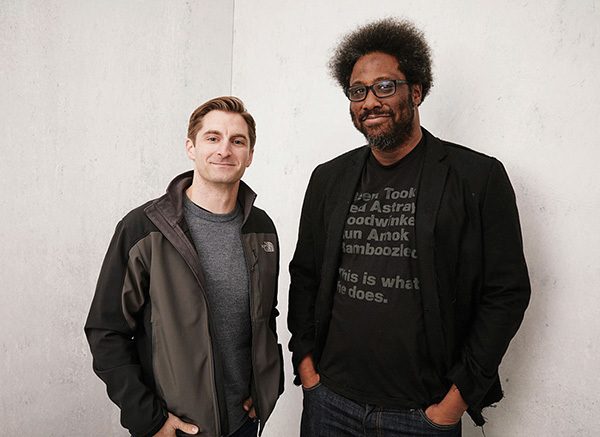 Jimmy Fox (left) produces and W. Kamau Bell produces and stars in United Shades of America. Silverman, an entrepreneur and former NBC executive. That was in 2014, when Fox opened a Los Angeles branch for London-based production company Objective Media as executive vice president. By coincidence, Bell was in conversations with CNN at the same time. The network made a match and United Shades was born. One of six shows on the 35-year-old Fox’s slate, it was nominated for an Emmy this year and renewed for a second season. Back in college, Fox saw himself as a future sports broadcaster, but was becoming a producer. Before the old gym became the Black Box Theatre, he staged a “full-on wrestling show” there once a year for three years. Dubbed CLW for Cal Lutheran Wrestling, the scripted theater event had a budget from the student Programs Board and featured an authentic wrestling ring, a big-screen TV and backstage interviews. A football player who held the Kingsmen record for career receiving yards (until Eric Rogers ’13 broke it), Fox in 2005 made the 30-member stunt squad for the movie The Gridiron Gang starring Dwayne “The Rock” Johnson. He’d been encouraged to try out by his dad and by contestants on television’s Biggest Loser, whom he’d assisted on set as a so-called talent wrangler. He also performed stunts for a few weeks in Austin, Texas, for the pilot of the series Friday Night Lights. In search of a “real job,” Fox aimed specifically to work for Silverman – who’d brought Americans The Office on NBC, Ugly Betty on ABC and many others – and in 2007 he beat out about 50 applicants for an opening. During Fox’s first week at work, the new boss joined NBC Entertainment as co-chairman. Fox followed and followed again in 2009 as Silverman left NBC to found the production company Electus. Finally, after more than four years spent watching the company expand as its head of creative development, he was ready to take over his own office. It’s still unusual for one person to produce both scripted shows, a medium for writers, and unscripted shows, where the producer has creative control from the start. The best thing about his role, Fox says, is that he can now pitch just a few projects that he loves. marriage. He was excited to invite three of his childhood crushes/idols from 1990s television shows – Jodie Sweetin (Full House), Christine Lakin (Step by Step) and Beverley Mitchell (7th Heaven) – to do a reality show, Hollywood Darlings (POP), about their lifelong friendship, family lives and work. United Shades is also near to his heart as an expression of his belief that different groups can always find common ground.